Important Documents Series Part 1: What Should You Keep for Estate Planning Purposes? Many people worry about having the appropriate documents on hand. 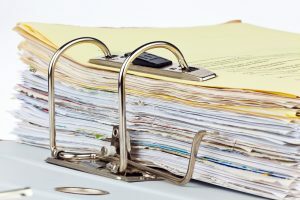 In this four-part series, we’ll explore the various issues associated with keeping documents so that you know exactly what to hold on hand for the long term and what can be disposed of in a safe manner after an appropriate period of time. Certain documents should only be kept for three months or less. These might initially seem important or have personally identifying information on them, but they don’t need to be kept over the long haul and could actually expose you to a higher risk of identity theft if they’re floating around your home. Unless you have specific issues, like business deductions on your income tax return or company reimbursement practices, these receipts become inconsequential after a three-month period and can only add to the clutter in your office or your home. Your canceled checks or credit card and bank statements can be proof of payment for regular purchases and utilities. Certain documents need to be kept on hand for longer and we will explore these in tomorrow’s blog.